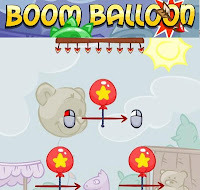 Boom Balloon is a new point and click physics based puzzle game from gamezhero. The goal in this game is to pop balloons by guiding them to float towards the spikes. You must not let a single balloon go float into the sky or you will have to restart the level. There are 24 levels in this game each with unique puzzle to solve. One general tip is to always use the momentum of the balloons by dragging them. Meanwhile, here is Boom Balloon walkthrough with the solution to all levels.